Cinderella’s Other Shoe by Philippa Rae takes the reader through the classic tale of Cinderella with a completely different perspective. This story is told by her shoes, specifically the more scuffed-up one, Stomp. Stomp tells the story of Cinderella’s stepmother and sisters bossing her around, how Stomp and Buckle, her sister shoe, have to watch where they step and where they sit. And when the Prince sends out an invitation to a party, the shoes are the first to predict the fate of Cinderella’s home-made dress. Stomp and Buckle watch as Cinderella cries and when a fairly nice pair of slippers comes into view, Stomp and Buckle are transformed to take Cinderella on a very magical night. But the fun all ends at the stroke of twelve… We know what Cinderella did when she lost her slipper, but what did the slipper do? 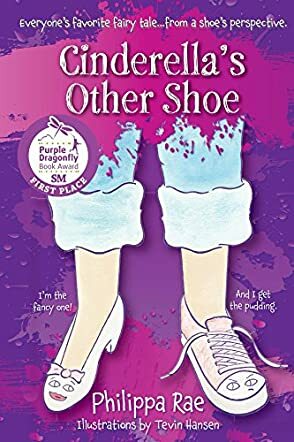 Cinderella’s Other Shoe by Philippa Rae is a fantastic spin on the classic fairytale. The cover is vibrant and appealing, eye-catching and interesting. At the beginning of the book, the reader is introduced to all the characters through very well-drawn illustrations. As this is a children’s book, the illustrations are a wonderful addition. As the title states, this story is about the soon-to-be-princess’s other shoe. It’s a unique perspective and a bold one to use. Philippa added just enough extra detailing so readers familiar with the original story would be guessing how the plot would run. And although shoes come in a pair, their personalities aren’t twins. Stomp and Buckle, the two sister shoes, had highly contrasted personalities and parts in the story, allowing the reader to connect to the character, even if it was a shoe. The language used is simple enough for a child to form a picture in their mind without getting lost in the details or the continuation of the plot. The layout of the story, being broken into chapters, made it easy to have a pause to catch up if needed. The marketability of this story is bound to be good. With the cover being pleasing to the eye, the tale and perspective being bold, and the unique twist at the end, this book is probably going to be found somewhere on a yellow brick road making children (and adults) smile.